Sweating is normal and beneficial. However, some circumstances cause us to sweat more than others. For special occasions like weddings, business presentations, or other nerve-inducing situations, we've got just the solution here at Kleinert's. Since 1869 we've been manufacturing and selling a complete line of patented products that are made to protect you in your time of need. Even for health concerns like menopause, but especially for one-time events, our disposable shields http://www.kleinerts.com/Disposable-Underarm-Sweat-Pads.php are ideal products for men and women of all ages. Even if you don't normally sweat, some events can make you very nervous and induce excessive perspiration beyond typical amounts. Outdoor events can exacerbate this issue as well, so disposable shields come in quite handy. Made of super absorbent materials our mens disposable shields http://www.kleinerts.com/Mens-Disposable-Underarm-Sweat-Pads.php can be used all day long and be changed only as needed. Not only will you save yourself the embarrassment of underarm wetness stains, but you'll also save on dry cleaning bills and other clothing costs. These shields adhere to any fabric quickly and can be removed just as easily, even when dealing with delicate materials like silk. You can order our disposable dress shields, our dress shields exclusively for women or our 100% cotton disposable dress shields in a number of quantities. 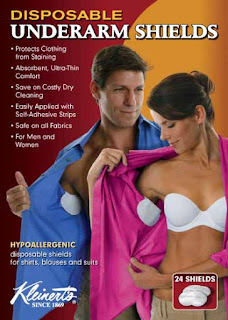 For men and women, we sell packs of 12 disposable underarm shields that will keep you dry and odor-free with each use. You can order one pack at a time, or you can tell us how many you would like each month and we'll send them to you like clockwork so you never run out.